A sophisticated gentleman of our acquaintance recently inquired about our philosophy when it comes to shaking versus stirring. This topic is a puzzler for many a home bartender. We have plenty to say on this and related subjects, and we expect some will disagree. We would love to hear what others think about it, so please do write in. First of all, some people seem to think that shaking dilutes the drink more than stirring. That’s just silly. It can dilute faster perhaps, but the amount of dilution is purely due to how long you stir/shake and the amount of force used in either method. The main difference is that shaking makes the drink rather cloudy and also creates ice shards, which you may desire in some drinks but not in others. Personally, when we order a martini out on the town, we always instruct the bartender to stir. In our opinion, a martini should be as clear as summer rain (and a rainy summer day is a perfect time to enjoy one). The amount of dilution you want is a matter of personal preference for the particular drink in question. As noted above, you can achieve the desired amount of dilution using either method. We suppose you could also sit the shaker or mixing glass on a window sill and walk away from it, but most of us want our cocktails more quickly than that. For most drinks, we fill the shaker or mixing glass 2/3 with ice. This is enough for about 1/3 of the ice to peek out above the surface of the undiluted liquid. For our taste, when the ice melts to the point of being even with the surface of the liquid, the drink is usually diluted enough. We stir anything composed entirely of base liquor, liqueur, vermouth, and bitters. Typically, these are drinks that we don’t want to cloud up: e.g., Martini, Manhattan, negroni, and all the various members of those families of drinks, including the Boulevardier, Remember the Maine, and Raultini. 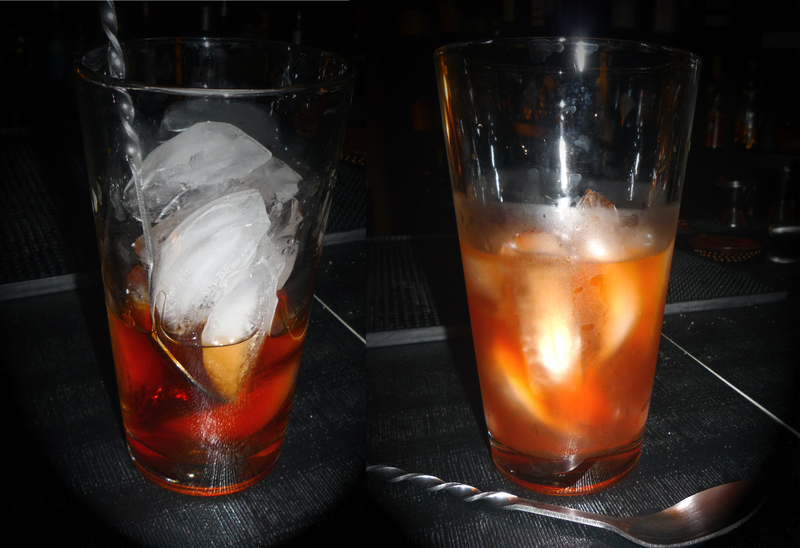 We use glass instead of a metal tin when we prepare a stirred drink, mainly because it looks prettier. Some bartenders have very fancy mixing glasses with pouring spouts built in, but we just use a standard pint glass. We shake anything that contains citrus or egg white. That includes margaritas, gimlets, daiquiris, whiskey sours, and the like. A note on dry shaking: The dry shake is not just a hangover symptom. It’s also an important step in any drink that includes eggs, such as sours, fizzes, flips, etc. This is especially true if there is citrus AND egg. The protein in the egg and the acid in the citrus form an emulsion, which gives the drink the proper texture and also helps create foam. The ingredients emulsify best at room temperature. Therefore, you want to give it a dry shake BEFORE you add ice and then shake it again. There is a lot of confusion about the names of different types of cocktail shakers, but the following adheres to the terminology we see most often used among professionals. A Boston shaker is a two-piece set composed of a small tin and a larger tin. An apparatus with a built-in strainer and a cap is called a cobbler shaker. There are also French shakers, which are basically cobbler shakers without the built-in strainer. 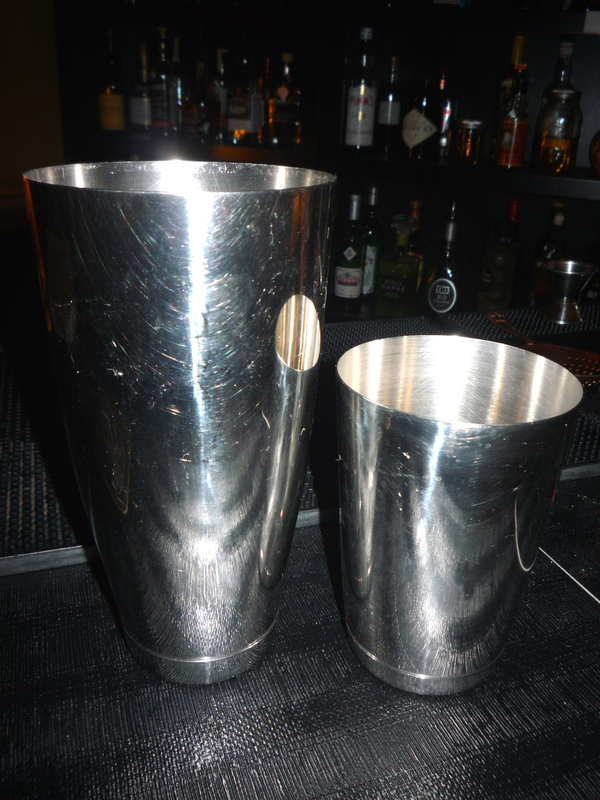 Most of the pros we know prefer a Boston shaker, or they improvise a variation using a mixing glass and a large tin. We prefer a Boston shaker ourselves because it’s easy to clean and highly versatile. We don’t like to use a glass and tin because we have broken too many of our pint glasses experimenting with that method. Other than that, it is really just a matter of personal preference. Let us know what you think about dilution methods and related topics in the comments.